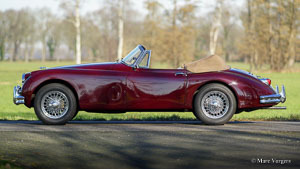 Today I introduce you to fourteen newly arrived classic and sports cars for sale. The test-drives were moments of great joy with this varied bunch of vintage machinery! Fast and stylish four-cylinder coupés, hairy chested six-cylinder British roadsters and powerful V8 ‘thunder-horses’… What else does the enthusiast need? The big surprise was the awesome and quite eccentric 1971 Avanti II. This magnificent, corvette V8 powered, ‘four-seater sports car’ was designed by the team of the renowned American designer Raymond Loewy around the year 1960. A truly remarkable and special American automobile! We have also added many newly arrived rare vintage original motoring accessories to our Classentials WEB-SHOP! *Type errors and price-changes reserved. Subscribe to the E-mail newsletter to be informed of ALL prices. You can subscribe to this monthly newsletter at the right bottom of the website. Alfa Romeo Giulia 2000 GTV, year 1975. Colour Faggio (very dark red / brown) combined with a beige leathercloth interior and black carpet. 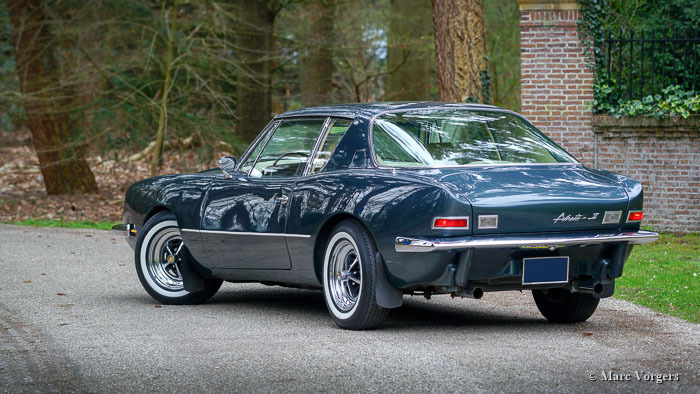 This gorgeous Alfa Romeo ‘Bertone’ was sold new to a German military man in Hamburg. This US model Giulia GTV 2000 was never exported to the USA and the car was fitted with twin double Dell’Orto carburettors instead of Spica petrol injection. 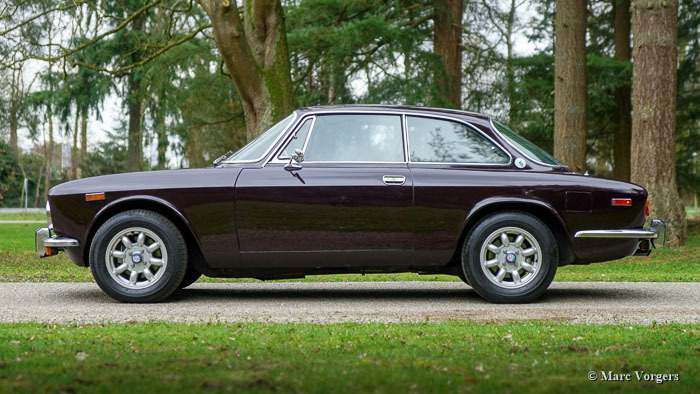 This wonderful Alfa Romeo was extensively restored. The automobile is in excellent condition and the car drives perfectly! Austin Healey 3000 Mk I (BN7) two-seater, year 1960. Colour Old English White with a red leather interior trimmed with white piping. Red carpet and black rubber protective mats. Black vinyl soft-top and aluminium side-screens. 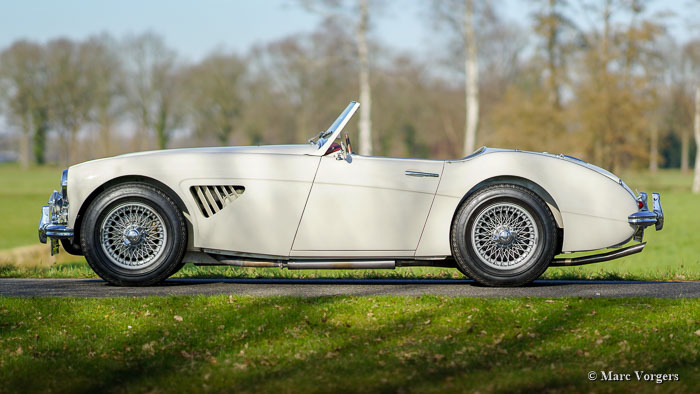 This is a rare and sought-after Austin Healey 3000 Mk I (BN7) two-seater, only 2825 cars of this type have been built. 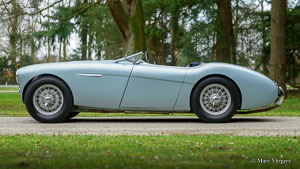 This gorgeous ‘Big Healey’ was shipped from the USA to the Netherlands in the year 1997. 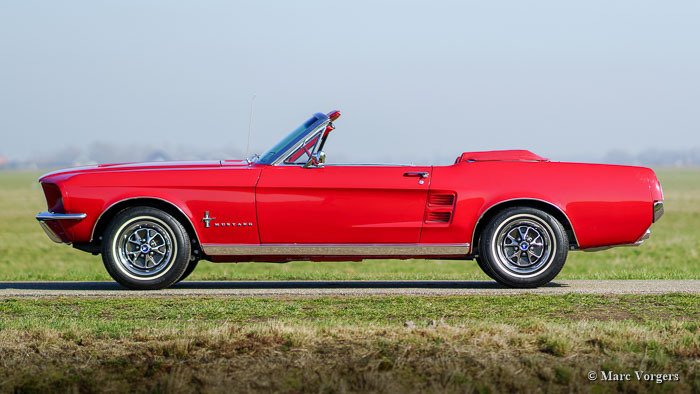 In the Netherlands, the car was extensively and beautifully restored. 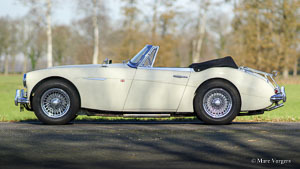 This Austin Healey is in a superb condition and the car drives perfectly! 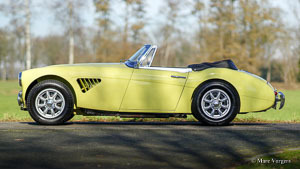 Triumph TR 250, jaar 1967. Kleur Royal Blue gecombineerd met een Bordeaux leren interieur en donkerblauw tapijt. Zwarte mohair soft-top en een donkerblauwe hood-cover. 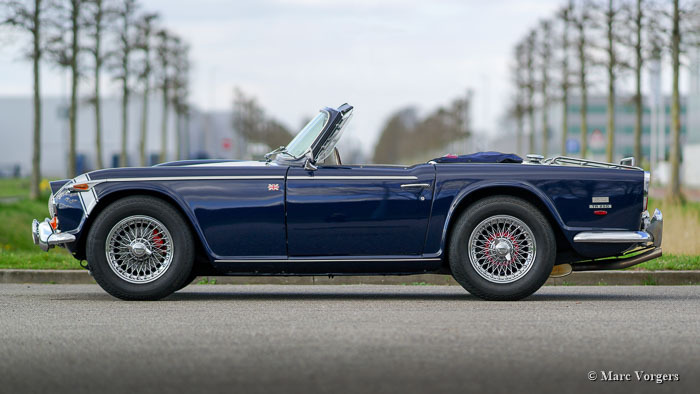 Deze fantastische en vrij zeldzame Triumph TR 250 is in het verleden gerestaureerd. 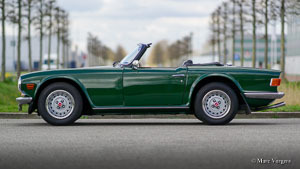 Deze TR 250 verkeert in excellente tot sublieme staat en de auto rijdt perfect! De motor is gereviseerd en aangepast voor loodvrije benzine. 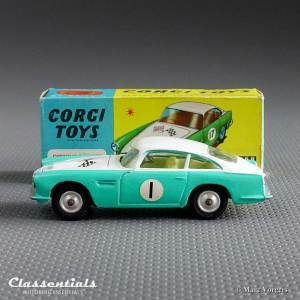 Dit is een zeer begeerlijke TR 250, u zult in de huidige markt niet snel een beter exemplaar aantreffen! Classic Mini ‘Outlaw’ 1275, year 1985. Colour white combined with a black roof-top and wide black wheel-arches. Black Cooper interior with crème white seat contrasts and black carpet. This extravagant Leyland Mini ‘Outlaw’ 1275 cannot go unnoticed… The white body colour, the WIDE wheel arches, the fantastic polished wheels and the grumbling exhaust note all make a statement; HERE I AM! 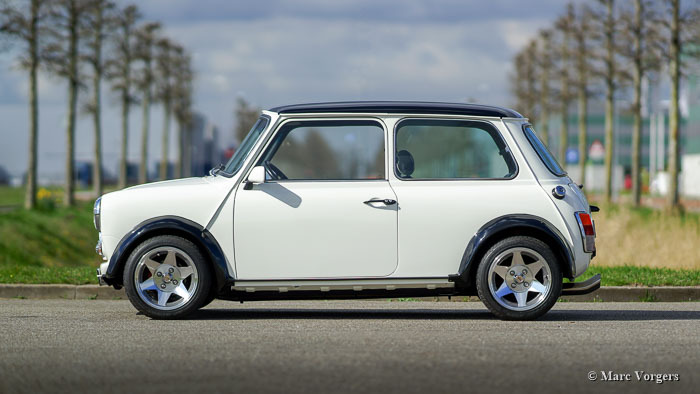 This Classic Mini is in superb condition and the car drives and feels like new! (Studebaker) Avanti II, year 1971. Colour blue metallic combined with a beige leather interior and beige carpet. This wonderful Avanti II was sold new in the USA, in the year 2014 the automobile was imported to the Netherlands. 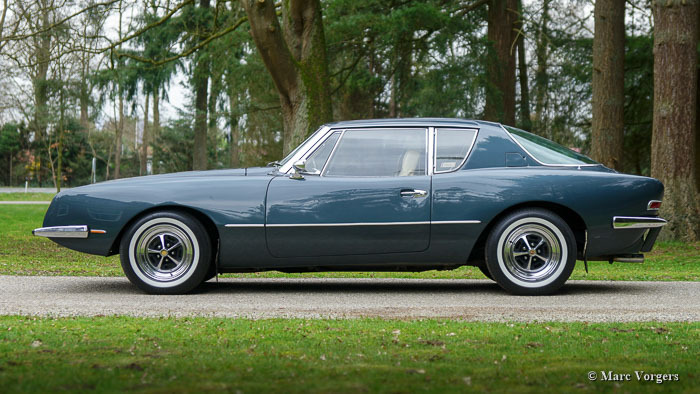 From new the car has driven only 51.000 Miles; this Avanti II is in a super original condition! The Studebaker Avanti was designed by the design team of the world-renowned industrial designer Raymond Loewy, and the car was introduced on the market in 1962. The ultra-modern looking bodywork was fabricated of Glass fibre Reinforced Plastic (GRP). The Studebaker Avanti was marketed as "America's only four-passenger high-performance personal car." This is a super original Avanti II in beautiful condition! 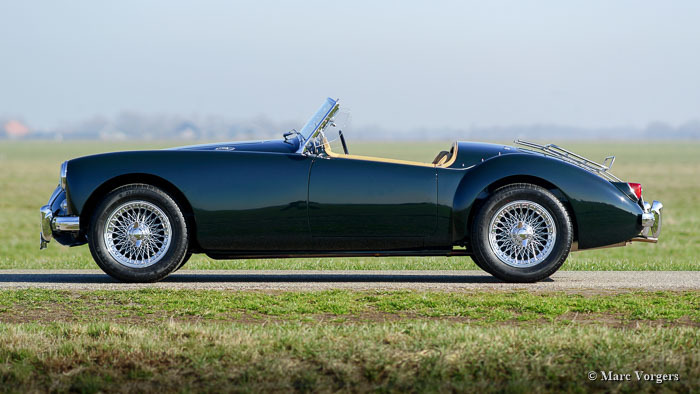 MG MGA 1500 roadster, jaar 1956. Kleur British Racing Green gecombineerd met een beige leren interieur en zwart tapijt. Zwarte soft-top en tonneau-cover. 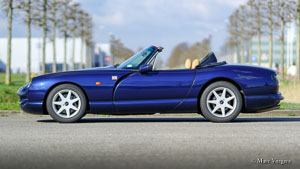 Deze prachtige MGA roadster is uitgebreid gerestaureerd door een Nederlands restauratiebedrijf. Een fotoreportage van de restauratie is aanwezig. De auto verkeert in sublieme topstaat: concours! MG MGC roadster, year 1969. Matching numbers and colours, a Heritage certificate to confirm this is present. Colour Snowberry white combined with a black interior. Black leather comfort seats with a higher back and head-rests. Black vinyl soft-top and hood cover. This gorgeous and quite rare MGC was sold new in Europe. The car was extensively restored in the years 2003 – 2004, invoices of this thorough job are present. The car comes with a beautifully documented history which is compiled in two thick file folders. 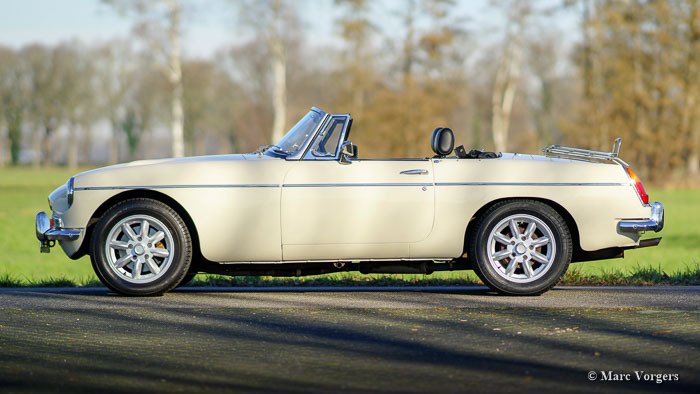 This MGC is in excellent to superb condition and the car drives superbly! 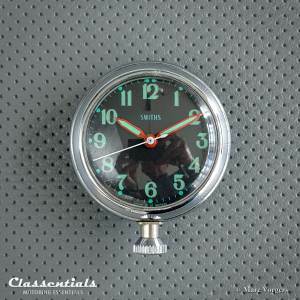 In March we have added a host of newly arrived wonderful and RARE vitage original classic car accessories. 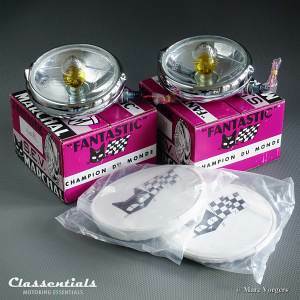 Fog & Spot lamps, compasses, instruments, key-rings, memorablia, Corgi Toys model cars and very rare Blaupunkt (STEREO) auto radios of the late 1960s and early 1970s. Our vintage original classic car auto radios are MP3 en Bluetooth ready; with our MP3 Kits and Bluetooth Modules you can play and stream your own music from your smart phone or tablet! See AUTO RADIO ACCESSOIRES. 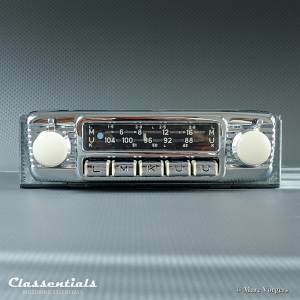 We supply the PERIOD CORRECT radio for your classic car! Choose any radio from our 1962 - 1982 STOCK-LIST (50+ radios to choose from) and we will inform you about the possibilities. 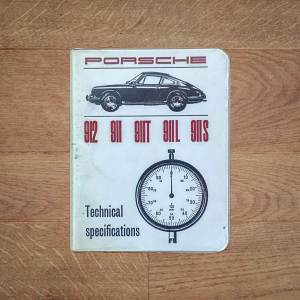 Classentials: "Your One-Stop Vintage Motoring Web-Shop!" Telephone international: +31 651 158 723.